Brittle is an odd flavor choice, and certainly not something that makes me think of winter. Thanks to the peanut-center it makes sense conceptually, but I'm a bit curious (and skeptical) about the execution. Will the chocolate taste like brittle? 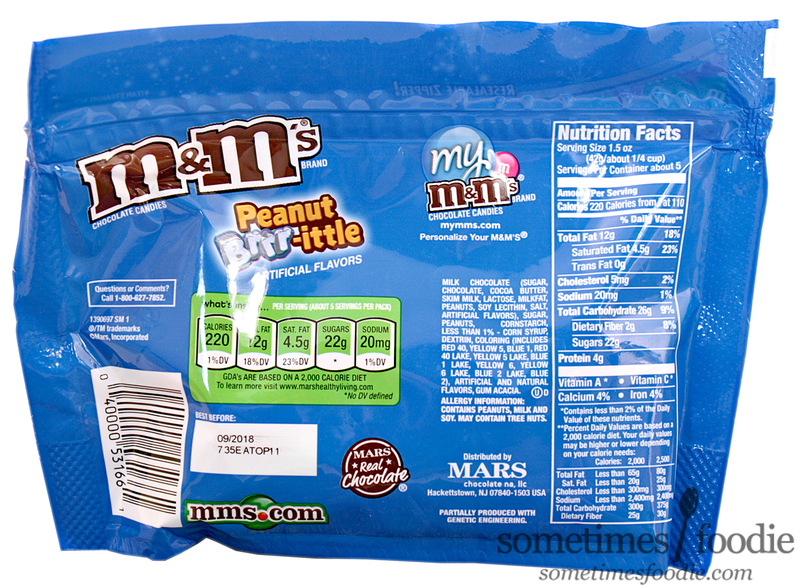 I doubt it, but I'm excited to see more peanut m&m's get the limited edition flavor treatment. Unlike Target's Halloween m&m release, Cookies and Scream (Review coming soon. Gotta love Halloween clearance sales! ), this bag is able to stand on it's own, thanks to the gusseted bottom, and it's re-sealable. Not only does it function well, but it looks a lot better than the sack-style bags. (Which are like photographing a tiny bag of potatoes.) Having the bag stand up makes photos much easier, and when it's own the gusseted bottom help the bag act like more of a bowl for easy share-ability. I'm a big fan! Graphically, it's not bad either. 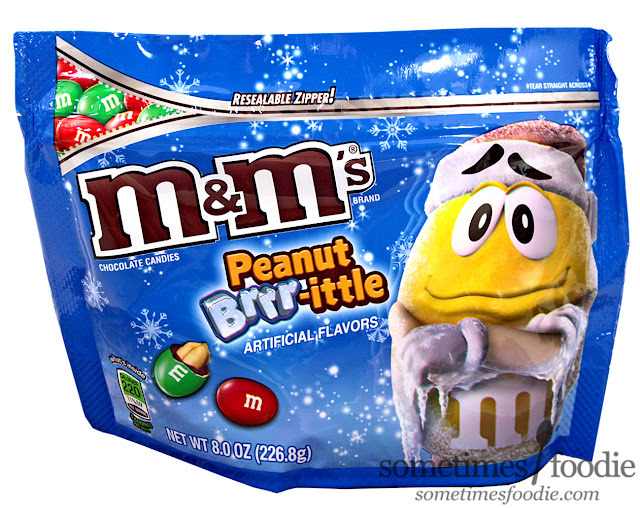 The bright blue color is winter-y without being too holiday specific (I see that frosty Santa Hat on Yellow's head! ), and the CG snowflakes in the background are really nice. The weakest part of the design is the mascot himself, who's caked in ice and shivering his shell off, but even that isn't a total miss for me. All in all, I'm pretty impressed, and I hope this is how all of the other limited edition flavors will be released in the future. It's pretty snazzy! 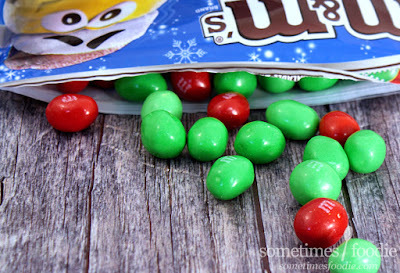 Inside is a sea of red and green candies (there goes the holiday neutrality!). The aroma is slightly bitter, but in a good way, like coffee grounds, or burnt caramel. I'm getting flashbacks to the Coffee Nut m&m's (which won the flavor contest and are now a permanent addition), and the burnt notes are giving me a little hint of toffee brittle, but this is more-so coffee than anything else. I took a bite and, as I suspected, the chocolate still tastes chocolate-y, not brittle-y. We have a crunchy peanut, which is the most brittle-like things about this candy, mixed with chocolate and a bold caramel coffee flavoring. It's somewhat successful, since the caramel notes are somewhat brittle like, and the peanut-y crunch helps with the illusion, but in the end these reminds me more of flavored coffees than their namesake. Honestly, these tastes WAY better than I ever expected them too, and I like them a lot. 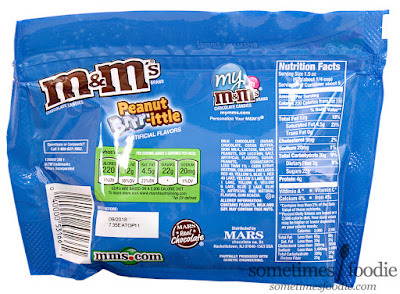 I find myself mindlessly munching away on them at my desk, and I am going to be sad when they're all gone. If the coffee nut m&m's left you a little underwhelmed, you owe it to yourself to try these.